Why is Yoga so popular? Come Experience this workshop and find out! This four class session is designed for beginners or those who are returning to yoga after a long absence. We will learn the basics of yoga postures designed to increase flexibility and strength, relax the body and mind to reduce stress, and improve range of motion and concentration. This is a fun, gentle class for all ages and body types. No experience needed! Flexibility is NOT required! PRE-REGISTRATION REQUIRED: Class size is limited, call Akhila 432.6929 TODAY! WHAT ELSE? Bring your own mat or borrow one of ours. Avoid eating a large meal 2 hours prior to class and dress comfortably. Please feel free to call Akhila if you have any questions. Gift certificates available upon request! *Akhila founded Dragonfly Yoga studio in 2005. 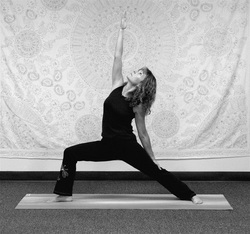 She is a certified, registered yoga instructor with over 450 hours of formal Yoga teacher training.